Like nearby Cape Royal, Cape Final offers almost a 270° panorama over the eastern Grand Canyon, with the advantage that the viewpoint is less obscured by trees; all the scene is viewable from a single spot, so this is perhaps the best of the north rim overlooks. The point may be reached by a two mile hike on an old forest track, long since closed to all vehicles, and although the walk is easy and mostly level, few people make the trip hence the viewpoint has the added benefit of solitude. Quite a small parking area is provided at the trailhead, which is located in a clearing in the tall pine woods 2.5 miles north of the road's end at Cape Royal. 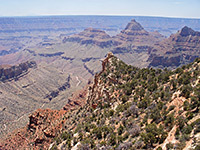 Panorama of the eastern Grand Canyon from Cape Final. From the carpark, the route climbs gently, curving through the woodland up to a flattish area that offers very pleasant walking - the surface is flat and free of stones, the gradient gentle, and the surroundings shady. 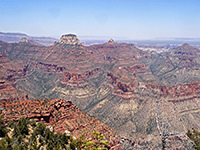 The trees are well separated, and the forest floor has no undergrowth so the views are quite extensive even though the trail affords no immediate glimpse of the canyon rim. Some parts of the forest show signs of recent wildfires. The path descends into a shallow basin and veers north, approaching the plateau edge for the first time, and giving a vista of red buttes and cliffs around the upper end of Lava Creek, before turning back south, away from the rim. The final section runs through more open woodland of smaller trees, down a slope, through a cluster of bushes and up between a few large boulders to the point. 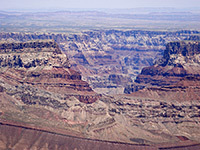 The main difference between Cape Final and other viewpoints further west is that the cliffs on the far side of the Colorado rise up almost vertically from the river to the rim, with hardly any tributary canyons - two great, colorful escarpments (Desert Facade and Palisades of the Desert) together extend for 20 miles, broken only by the narrow gorge of the Little Colorado River, one of the largest tributaries of the Grand Canyon. The actual confluence is not in view, as it is hidden behind two buttes of Kaibab limestone (Chuar and Temple), which became infamous in 1956 as the site of a plane crash resulting from a mid air collision, an accident that caused the deaths of 128 people. The land between here and Cape Final has the usual mixture of mesas, cliffs and ravines, with the most prominent features in the foreground being Juno Temple, Jupiter Temple, Unkar Creek and Freya Castle. Several miles of the south rim plateau are in view, while the eastern horizon is formed by the even flatter Painted Desert, part of the Navajo Indian Reservation, where the elevation change is less than 100 feet over a 12 mile stretch of the rim.